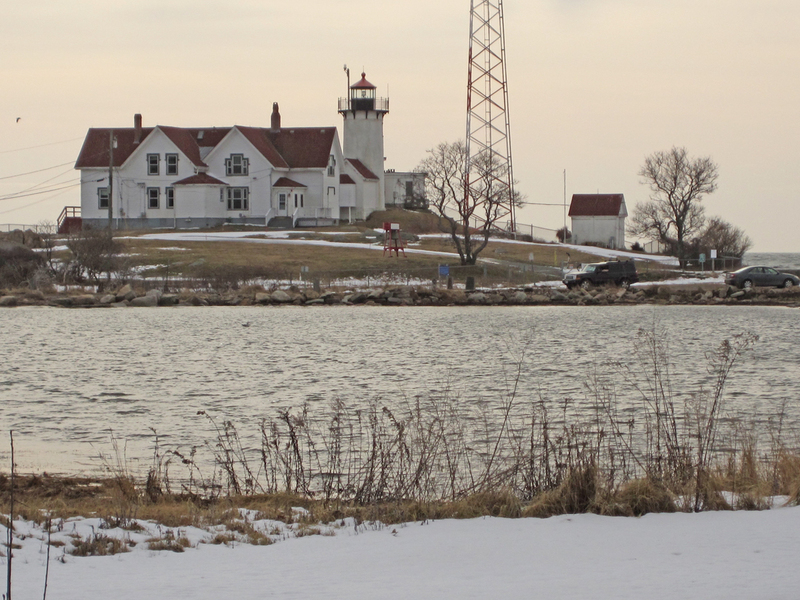 Posted on March 8, 2016 by Barry V.
I had brought along Chris Leahy’s excellent GUIDE TO WINTER BIRDING ON CAPE ANN, published by Bird Observer Magazine. This special reprint (I covet my copy), covers every nook and cranny along Cape Ann’s shore, with detailed notes on access, vantage points, and perhaps most importantly in this tight mix of public and private land – PARKING! Although I spent most of my day at the sanctuary, I used this guide to explore adjacent areas, all of which are prime hotspots for birds. The area is of special interest to those interested in gulls and gull identification. Indeed, you could hardly find a better spot than Eastern Point in winter for a good variety of Larids. 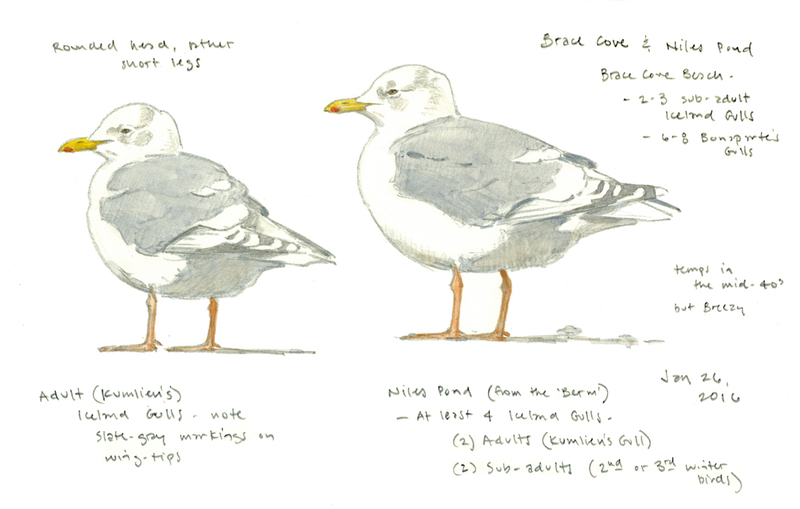 Today, and with Jim Berry’s help, I observed seven species of gulls in dozens of plumages. Besides the more common species – Herring, Great Black-backed, Ring-billed and Bonaparte’s – we found as many as six Iceland Gulls, two Glaucous gulls and one Black-headed gull! 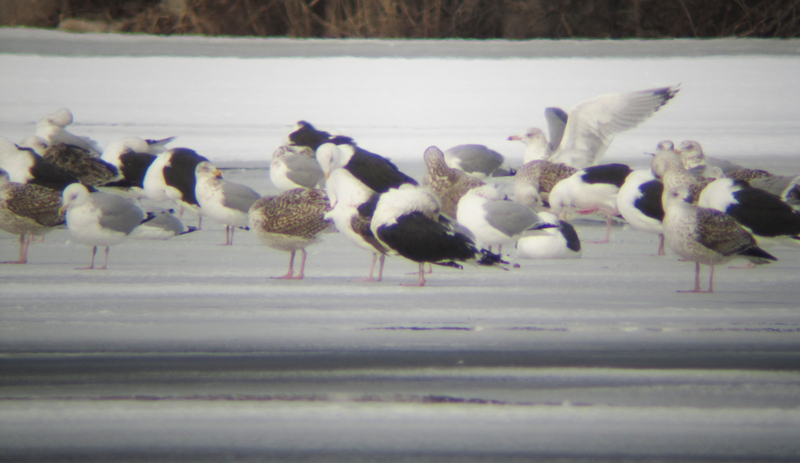 Here’s the drill: You set up your scope at Niles Pond and methodically work your way through the throng of gulls loafing on the ice. You look for anything unusual or out-of-place: individuals of a slightly different size, odd colored legs and bills, slightly lighter or darker mantles, subtle shifts in overall color, and especially – pale wing tips. The view of Niles Pond from the south end of Brace Cove was the best spot for studying gulls, today. Not only was this spot closest to the birds, but it was protected from the wind, and I could sketch comfortably. Brace Cove Beach was also a good spot for gulls. 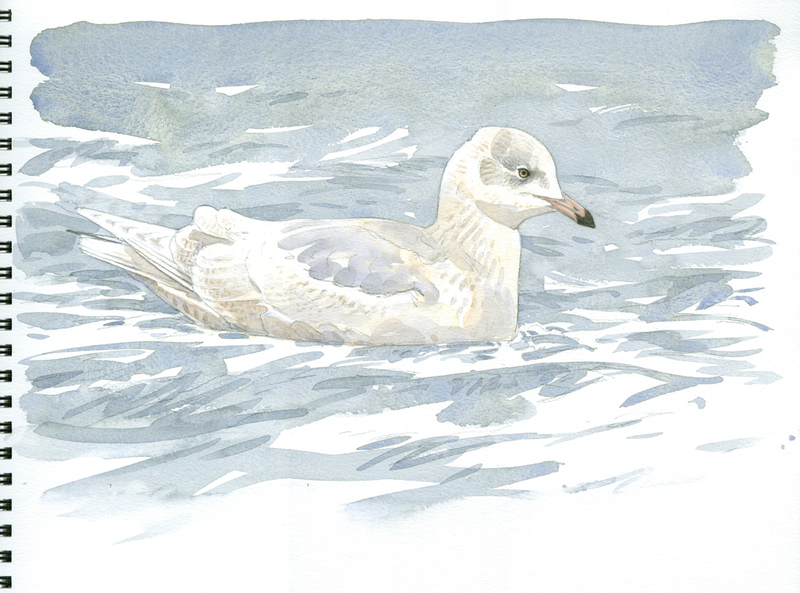 The sub-adult Iceland gull in this painting was foraging in the waves just off the beach, and a nearby flock of Bonaparte’s gulls was joined by a single black-headed gull. 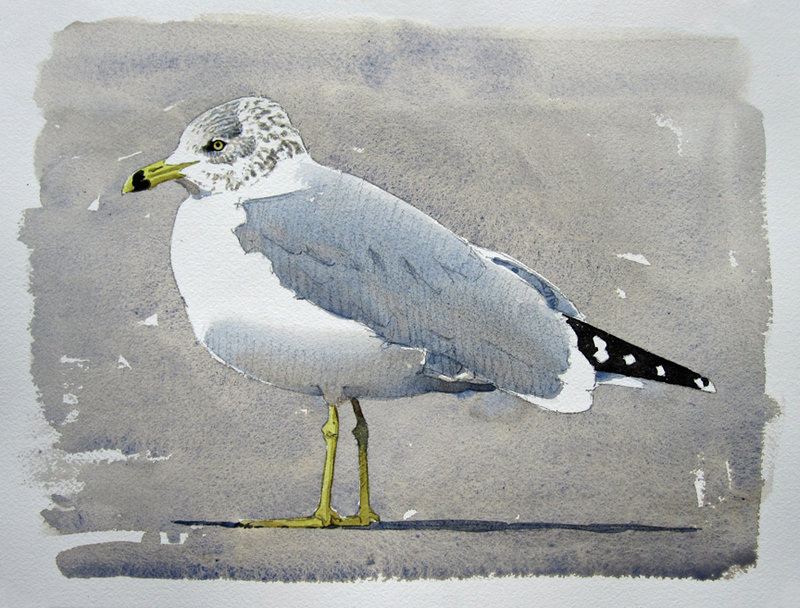 This entry was posted in Artists, Barry Van Dusen Residency, News and tagged Barry Van Dusen, Bird Observer Magazine, Black-headed gull, Bonaparte's Gull, Brace Cove, Brace Cove Beach, Eastern Point Wildlife Sanctuary, Glaucous Gull, Gloucester, Great Black-backed Gull, GUIDE TO WINTER BIRDING ON CAPE ANN, Herring Gulls, Iceland Gull, Jim Berry, Larids, Niles Pond, Ring-billed Gull on March 8, 2016 by Barry V..
Posted on February 28, 2016 by Barry V.
Eastern Point Wildlife Sanctuary is a small reserve, but it boasts a surprising diversity of habitats, including a mixed deciduous forest, a meadow, a cobble beach, rocky shorelines and a small saltmarsh. At the sanctuary parking lot, you realize you’ve driven as far out the East Gloucester peninsula as solid ground will allow (at the very tip of the peninsula is the Eastern Point Lighthouse). I am surrounded by ocean – the relatively protected waters of Gloucester Harbor lie to the west, and to the south and east are the vast expanses of the Atlantic. 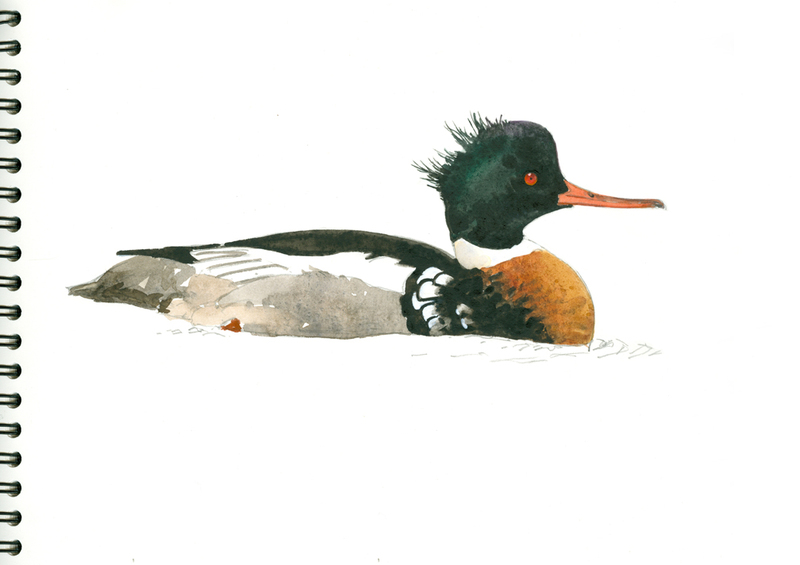 To the north, a small cove hosts a handsome flock of red-breasted mergansers, along with gadwall, mallards and a few buffleheads and eiders. 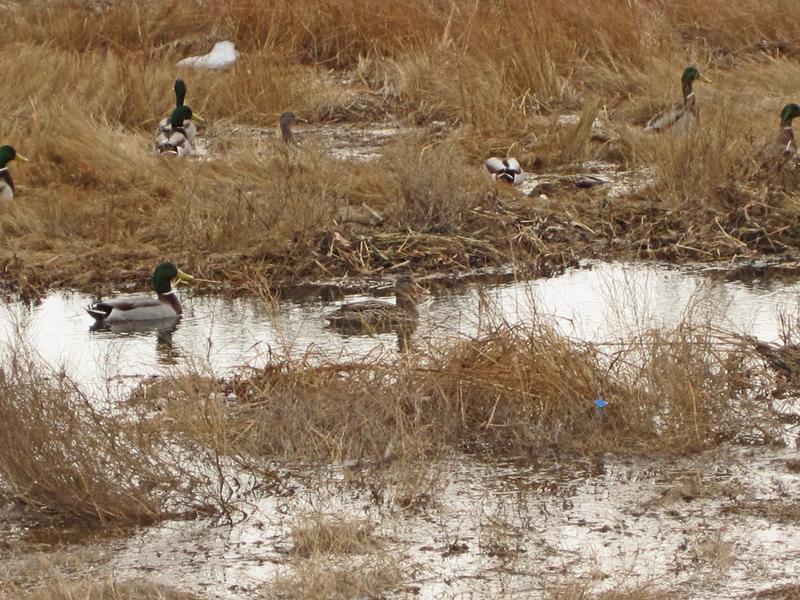 The tiny adjacent saltmarsh is undergoing restoration to restore natural water flow and encourage native vegetation, but I could see that it was already a favorite haunt of mallards and black ducks. 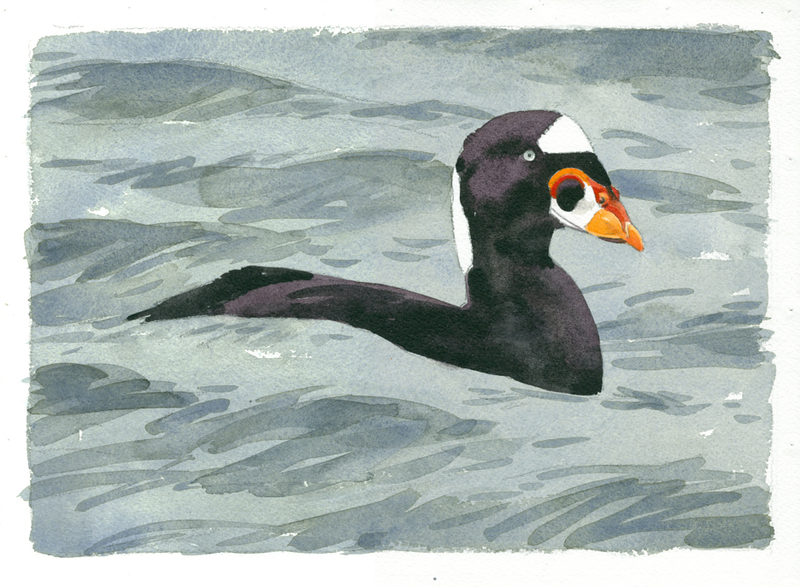 Out in the harbor are more of the same species, joined by a winter loon and a few pairs of surf scoters. One pair of scoters favors the area near shore, affording excellent views through the scope. Aside from puffins, few birds in New England have such outrageous bills! I start some drawings of the shapes and patterns involved, but with the birds bouncing around on the waves and diving frequently, and my eyes watering badly from the wind, my drawings are less than successful. Several times I retreat to the car to warm my hands. Nonetheless, I feel that my attempts are worthwhile, since the act of drawing brings an urgent attention to my observations, and supplies confidence for subsequent efforts back in the studio. Painting moving water has always been a challenge for me. If you over-render waves, they start to look frozen in place and you lose the sense of movement. I find it works best if I paint very quickly in a loose, gestural manner, and try to develop both soft and hard edges at the same time. I like to warm up my brush hand with a separate “practice sheet” before I tackle the final watercolor. That way I can start to feel the gesture of the waves, and develop a hand for the type of marks that will work best. The trails through the forest are easily explored in an hour or so, and they offer shelter this morning from the wind. 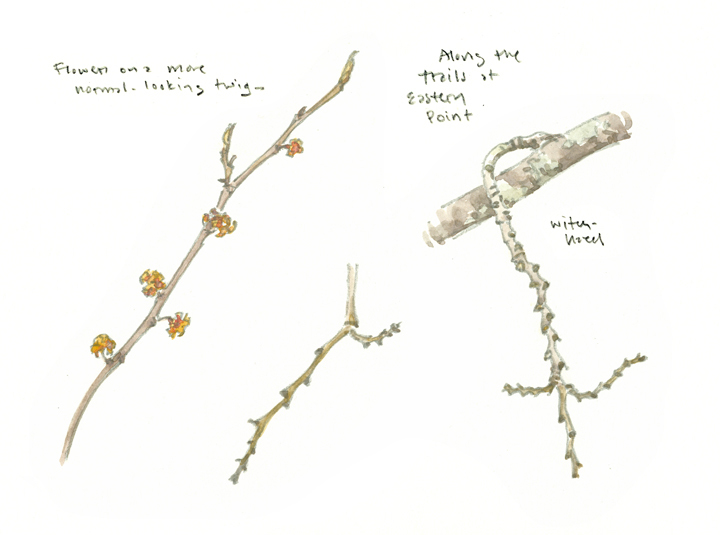 I find I can sketch comfortably, and make studies of some of the plants that catch my eye. The witch-hazel twigs here show a tight zigzag pattern, and I’m puzzled by small clumps of curious seed pods poking up through the snow. 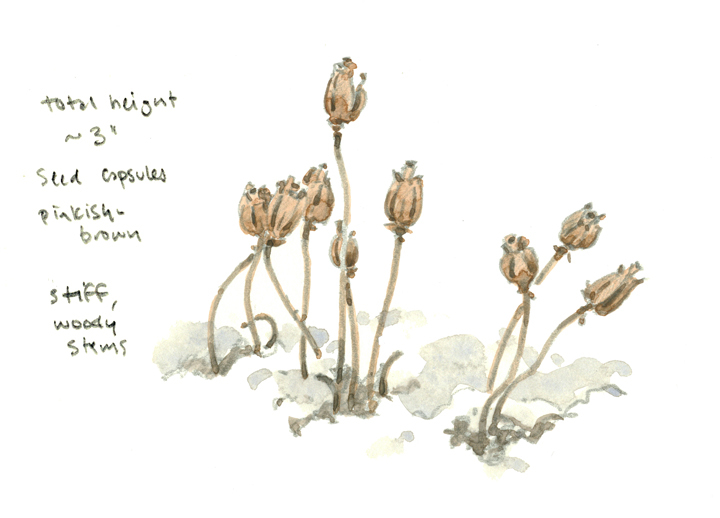 Later, I learned that the seed pods were those of Indian Pipes. As Joe Choiniere explained to me: “Although the flowers nod, the entire structure turns upward as it goes to seed and often fools people”. Gloucester is a popular winter destination for birders, so I am not surprised to meet some today, including Jim Berry, an expert in Essex County birds. 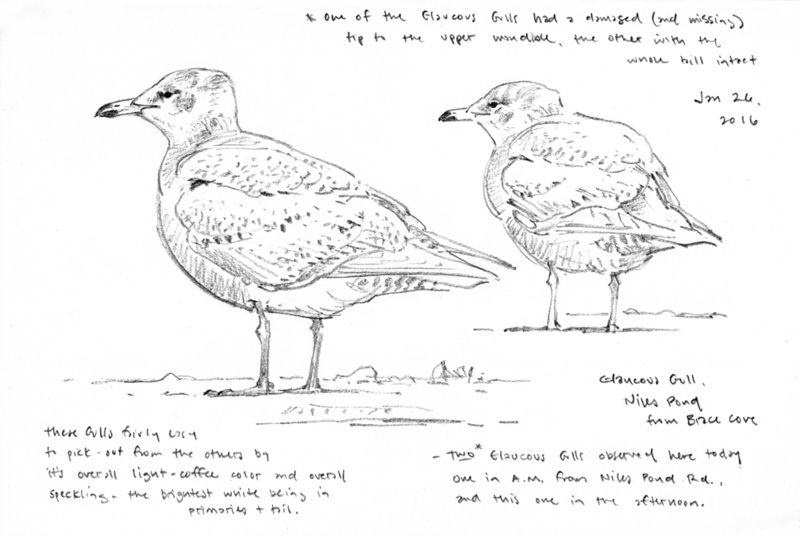 He points out a group of about forty purple sandpipers hunkered down on the lee side of the Dog Bar Breakwater – a bit too far off for sketching. Jim also helps me sort out the gulls around the point today (stay tuned for part 2 – Gull-ology). Most of the birders are, of course, moving from spot to spot in search of “good birds”, whereas I confine my observations to the sanctuary and the immediate vicinity. If you want to “do art”, you can’t run around a lot, too! This entry was posted in Artists, Barry Van Dusen Residency, News and tagged a cobble beach, a meadow, Atlantic ocean, buffleheads, ducks, Eastern Point Lighthouse, Eastern Point Wildlife Sanctuary, eiders, gadwall, Gloucester, Gloucester Harbor, indian pipes, Jim Berry, mallards, Mass Audubon, mixed deciduous forest, outrageous bills, purple sandpipers, red-breasted mergansers, rocky shorelines, small saltmarsh, surf scoter, water fowl, Watercolor, wildlife, winter loon, Witch Hazel on February 28, 2016 by Barry V..